If you are a Children's Hope family, please consult your Program Updates, your adoption consultant, and the yahoo boards for more information. The US Department of State held a conference call today with all US agencies facilitating international adoptions in Vietnam. This call was to inform agencies of a US Department official statement soon to be released, warning potential application families of the current US/Vietnam Memorandum of Understanding set to expire in September 2008. The State Department still does not know whether the agreement will be resigned in September or not. This statement will notify families, unaware of current conditions, to possibly reconsider beginning an adoption from Vietnam at this time. Children's Hope has continued to update our families about the current situation in Vietnam and we will continue to do so. This update is to prepare you as you see warnings appear on outside chat groups, e-mails or through the US Department of State web site. We expect the announcement to be made on Monday at the earliest. Click here, for US Department of State udpates. Congratulations to our two Traveling Families adopting from China. Both of these families will be flying into Guangzhou this weekend, to finalize the adoption of their daughters! 'The Call'. You are waiting for it, you remember it, you cherish it. If you wait years or only months, nothing diminishes the joy of that moment, when the phone rings and you realize - you are a parent. Two-time adoptive mom, Pam Bischoff waited in anticipation for her friends to feel that same joy, too. Read Pam's story, in the January E-news available online. With Christmas just behind us, and Chinese New Year (and Tet!) just ahead on February 7, your child's birth culture is on your heart. Beyond the holidays and festivities, Jean MacLeod reminds us that birth culture is both race and relational, too. See how you can share these important aspects with your child. For the holiday, check out the Kids Corner and celebrate Chinese New Year (you don't have to have completed a Chinese adoption to enjoy this!) by making Chinese lanterns, dragon centerpieces, or hand puppets with Nick, Jr.'s new star Kai-lan. The animated Chinese-American girl will make her breakout performance on February 7 on the new series, Ni Hao, Kai-lan. If you are unable to travel with your family to meet your adopted child in their birth country, meeting them at the airport is an experience you will never forget. Armed with "Welcome Home" signs and arms ready for hugs, Chicago Bears wide receiver Musin Muhammad and his family and friends barreled into their car with big grins. They were traveling to Chicago's O'Hare International Airport, where Muhammad comes face to face with the two children he had fallen in love with, adopted internationally from Ethiopia. View this father's experience on the Chicago Bears' web site. The Player Profile may be found on the right sidebar, labeled "Muhammad adoption feature". Thank you for your patience in the update to the blogroll, as I have been out of the office. There will be a regularly scheduled blogroll update on Friday, even if no one has "transitioned". 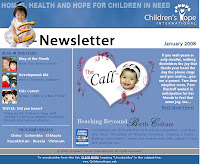 If you would like to add your blog to the Children's Hope International family blogroll, please email me with your blog address, your name, the state you reside within and the country you are adopting from. See someone that I missed that is traveling? Have a topic you'd like to see covered? Leave me a comment and let me know, too. Thanks for sharing and joining in on the open conversation! Orthodox Christian Christmas is celebrated in Russia, Ethiopia and Kazakhstan today. "The holiday is called the Birthday of Christ in Russia," says Yuriy Kudinov, Director of Children's Hope Russia Team. In Russia and Kazakhstan, the Santa figure is represented by Father Frost, or Ded Moroz. Dressed in robes and boots with a long white beard, Father Frost brings presents to children, sometimes on Christmas but also on New Year's Day. Approximately 40 percent of Kazakhstan's citizens celebrate this holiday today. Picured: Father Frost and the step-daughter, illustration by Ivan Bilibin from Russian fairy tale Morozko, 1932 - Wikipedia. Wendy has taken the time to jot down surprises from her first trip to Russia, packing musts and more advice for Russia travelers. Check it out! China Adoption: How Old Will My Child Be? In our December 31 referral group, six families received beautiful infant girl referrals. Five of these families received referrals for girls older than the family requested in their petition letter. Several Children's Hope International families have asked about the age requested in the family's petition letter versus the age of the child referred in this group. As outlined in the Hague Treaty on International Adoption, the CCAA's goal is to make a match that is in the best interest of the child and the family adopting them - with an emphasis on the child. 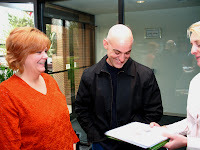 When making the referral match, the CCAA considers the child's paperwork and the family's dossier. The match is not made simply based on the age the family requests. The CCAA looks at the age of the parents, other siblings in the home, the family's life style, hobbies, interests, facial features, significant dates, etc. Families adopting from China are often amazed at how perfectly matched their child is to their family. The CCAA also attempts to keep families with the same agency in the same province to make traveling as a group in China easier. We certainly understand families' concerns about the age of the child at referral and want to respond to those concerns. It may be helpful to review the CHI Referral History from June 2003 to Present which is available on the CHI main/China Yahoo Group (adoptionchildrenshope). If you are not a member of the CHI main/China Yahoo group and would like a copy of the CHI Referral History, please contact your local branch office or Ann Tollefson (Ann.Tollefson@ChildrensHope.net) and an email of the history report may be mailed to you.